Expires 10/31/2014 Not valid with any other offer. You can use this voucher in multiple visits. Valid at New Braunfels location only. 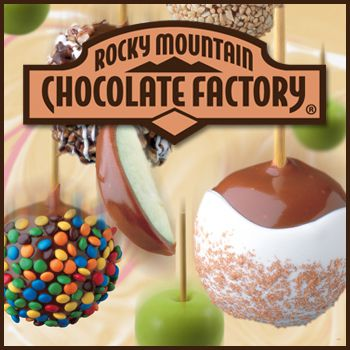 Rocky Mountain Chocolate Factory is famous for its amazing selection of old fashioned caramel apples. They all start with a crisp, green Granny Smith apple smothered with thick and chewy hand made caramel,then dipped in a variety of yummy toppings for a “just right” combination of tart and sweet. Let Rocky Mountain Chocolate Factory help make gift giving a sweet experience! Always appropriate, our gourmet chocolates demonstrate your high regard for customers, employees, colleagues, family, and friends. Whatever the occasion, be it birthdays, holidays, or just pure appreciation, make a lasting and tasteful impression with delicious gourmet gifts from The World’s Chocolatier, Rocky Mountain Chocolate Factory.